Oakworth Old Lane, Cowling, and the faint cup-and-ring carving. OS Grid Reference: SD 97300 42625. 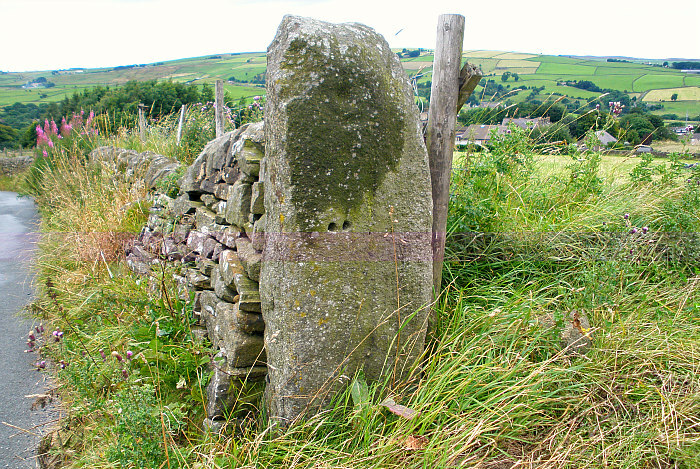 Standing beside Oakworth Old Lane, near Cowling, North Yorkshire, is an old gritstone gatepost that has a faint and worn cup-and-ring carving on its top face. This Bronze Age carving (petroglyph) was only recently discovered by a local man from the nearby village of Cowling. Quite obviously this old stone has come from the moors above Cowling where it might have been a standing stone, or it might have been broken off a larger rock? However that’s merely speculation, but its a strong possibility. The gatepost has, at some point, been chopped off at the top edge where the outer carved ring is, but this has not really caused much damage, the carving has not really been affected. To reach the stone from the A6068 Keighley Road, Cowling, head up Oakworth Old Lane (Old Lane) by the cemetery. Go up the lane past the houses until you reach the fields; not far along on the left-hand side is the gatepost and field entrance, while on the opposite side of the lane a driveway can be seen. 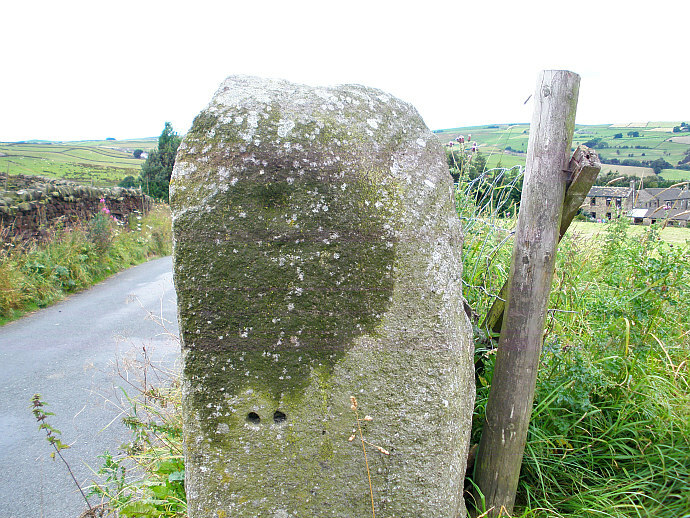 Oakworth Old Lane gatepost, with faint cup-and-ring carving. Oakworth Old Lane. Close-up of the cup-and-ring carving. This little carving of a single cup and single ring on the gritstone gatepost is now quite faint and worn, but nice all the same. The two holes lower down are recent additions. It is easily missed; but thanks to Mr Chris Swales of Cowling and The Northern Anti-quarian back in 2016 – it has been brought to everyone’s attention, and also to the farmer’s attention too! I went up there later that summer and got chatting to the farmer from Hallan Hill Farm; he was in the field with his tractor and spreading silage, I think, or transporting it somewhere else? He told me he didn’t realize what the carving was nor did he know how old it was, but he seemed genuinely interested. I informed him that it was “a prehistoric carving”. However, we don’t know where the stone came from – maybe it was brought from the moors above Cowling, where it could have been a standing stone? or did it come from a larger lump of stone and, if so, could it have had more cups-and-rings carved onto it. And how long has the gatepost stood in its present, lonely, position? Only in 2016 did the ancient carving get the attention that it deserves! With thanks to Chris Swales & TNA (The Northern Antiquarian). 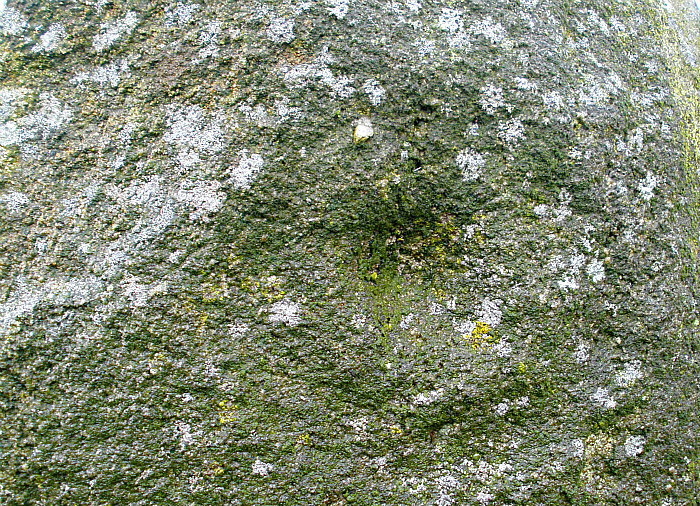 Categories: Cup-And-Ring Markings | Tags: Oakworth Old Lane Cup-And-Ring Stone near Cowling in North Yorkshire | Permalink.